The Obsidian Duo plays jazz, classical, and some popular music. 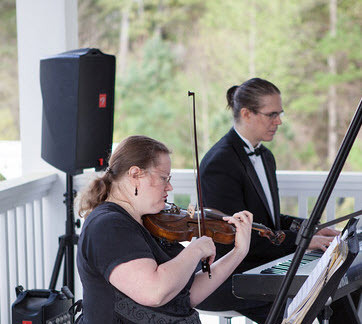 The versatility of violin and piano is the perfect choice for an event that requires different styles of music, such as classical music for a wedding and jazz music for a cocktail hour or reception. Because the duo reads from piano scores, there is a wide selection of music available for special requests. Unlike a string duo which can only play two lines of music, violin and piano gives a rich, full sound with only two instruments. The violin gives the music a classical flavor. The liveliness of the piano adds a fun element to pop and jazz tunes. For venues with no piano or for outdoor events, we bring a keyboard. Our new keyboard is a top of the line model that allows us to load a piano sound that was actually recorded from a concert quality piano. Here are some samples of our group. Click on any title to listen. The Flyers Daniel Padrón Original Latin jazz composition by pianist Daniel Padrón. Selected by a few former clients as a wedding recessional. Por Una Cabeza Carlos Gardel Featured in the movie Scent of a Woman. Jazz Waltz No. 2 Shostakovich Featured in the movie Eyes Wide Shut. The Princess Daniel Padrón Original composition by pianist Daniel Padrón. Here are some examples of music we perform, however we are not limited to this list.